We started 'Progress Report' during Adhocracy 2017 and its wonderful to continue to be supported by Vitalstatistix with this Incubator Residency. “What Currie has done with Concrete Impermanence is to channel the inexorable motion of things into the bodies of humans and the fibres of cardboard. All atoms. All in constant flux. All in the process of unbecoming. Yet, in the end, just when you think you’re in a world of quantum gravity, with curved space and all the rest of it, you are returned to the body. To the visceral experience of impermanence. In just a couple of weeks (17th and 18th March) Concrete Impermanence will be part of Dance Massive! This week Alisdair Macindoe and I have been in the studio at LWDance Hub working on ‘Progress Report’ a new work we are co-directing / choreographing. This time we are joined by the incredible Kialea-Nadine Williams, Sascha Budimski and Meg Wilson. It has been a lovely way to end the year! We have had a chance to touch on a few ideas which will be expanded further by the next work in progress showing at Vitalstatistix in April 2019. This week I will be performing at Artbank in Sydney. Eleanor Scicchitano has curated a new exhibition ‘A Vacant Space’. Bridget Currie’s work ‘Spooky action at a distance’ will be installed as part of the exhibition and I will perform the work we co-directed ‘Things meeting now’ with her forms for opening night Thursday 22nd November 6pm onward. Adelaide now has a dance festival and The Human Arts Movement and I will be presenting a new interpretation of 'Creatures' in response to Aldo Iacobelli's exhibition 'A Conversation with Jheronimus' currently viewable at the Samstag Museum of Art. By remaking 'Creatures' in response the the exhibition it is in conversation with a conversation and you can also join us after the performance for another conversation - between the artists. A conversation with Christchurch based presenter Adam Hayward in 2012 started my thinking and concept development of Concrete Impermanence. We had our first studio development in 2014 and the past four years have involved working with a talented team of artists each of whom has added to the strength of the project. For the past three weeks performers Amrita Hepi, Lewis Rankin and Stephen Sheehan, sound designer Alisdair Macindoe, lighting designer Matt Adey, creative assistant Carlie Angel, producer Jason Cross and I have been in residence at Restless Dance Theatre studios completing the work ready for premiere this week! It has been exciting, challenging and rewarding process to complete this work after four years of thinking, writing and working on it! We look forward premiering in Adelaide on the 17th and 18th of May. Another work I Can Relate is currently screening in the Space Theatre Foyer to coincide with the premiere of Concrete Impermanence at the Adelaide Festival Centre. 2018 has already been a big year! and more development of 'Concrete Impermanence' in the studio at Restless Dance Theatre and online, on the phone, in the lounge room, in my mind. So much still to do. 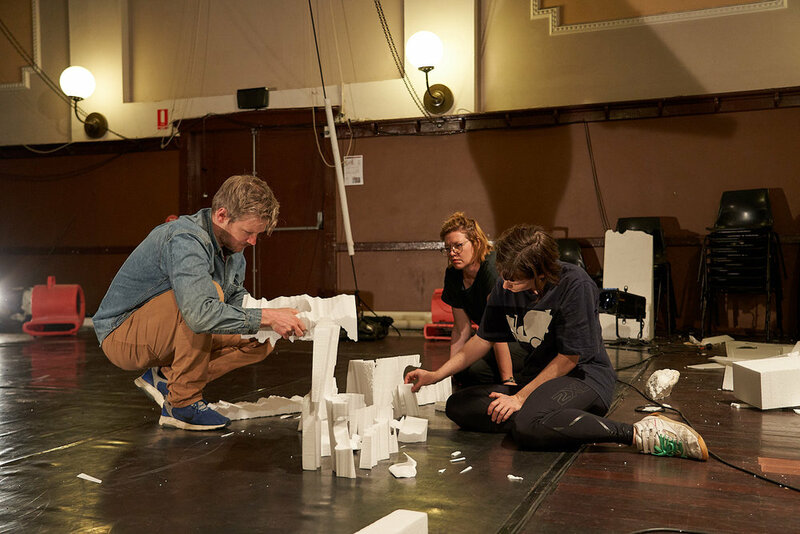 Look out for the premier https://www.adelaidefestivalcentre.com.au/events/concrete-impermanence/ in May 2018!! Huge thanks to everyone involved so far. 'I Can Relate' opens today at LIGHT MOVES festival of screendance in Limerick, Ireland. On the 21st of October 2017 I performed 'Sisyphean Action' on O'Sullivan Beach, South Australia as part of SUE - Series of Unexpected Events curated by Paul Gazzola for the Onkaparinga City Council and OSCA. We had 30ºC the previous weekend so had planned for a sunny day with a friendly dog walking audience and some beautiful sunset images. The reality was a lot colder 11ºC and more overcast. I had some dedicated audience members and some more transient walking audience. Perhaps due to the fact that they were walking quickly past in the cold, I soon realised that in order for my actions to be noticed I needed to perform for longer so chose to work with all four of the rocks at each performance - I had initially planned to increase the rock size throughout the day and only perform with each rock once, so it ended up being a very gruelling day.. see relief below post final rock lift! This week SUE - Series of Unexpected Events, curated by Paul Gazzola, opened in the Onkaparinga City Council. It runs from 14th-31st October throughout the Onkaparinga area. This weekend I was performing alongside David Cross and Heidi Kenyon, David Cross's work 'Trio'. Tuesday 17th and Tuesday 24th of October I will perform Sara Morawetz's work 'Survey' alongside Carlie Angel. 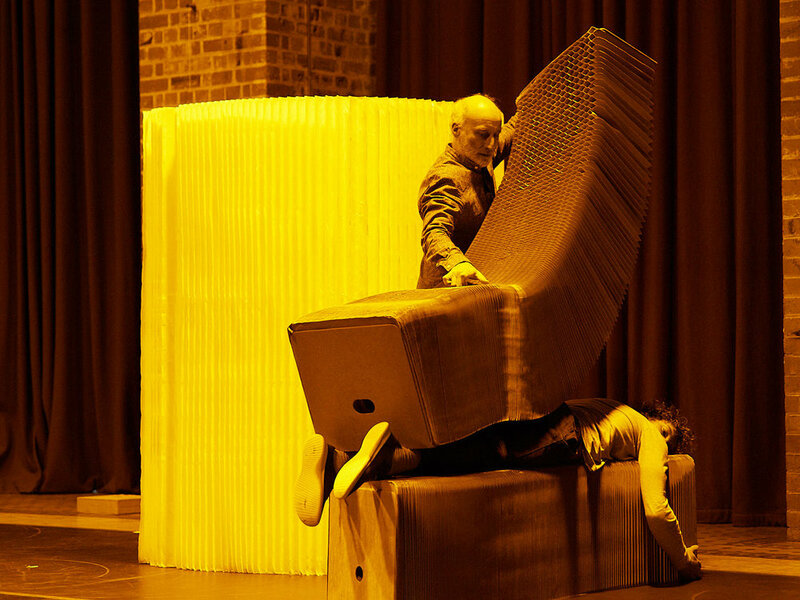 SUE is a creative festival of performance based interventions. SUE explores how innovative art events within outer suburban locations, spaces not normally associated with contemporary arts practice, can produce fleeting moments of difference, interest and intrigue to daily routines. SUE explores the curatorial themes of the unexpected, wonder and play to open-up a fluid and playful space for artistic strategies that can surprise, startle and astonish the public through uncommon and extraordinary activities. SUE gathers a group of artists whose practices employ performative, installation & time based outcomes, strategies not normally represented within the City of Onkaparinga public art framework, to create a suite of unexpected interventions across 20 selected sites. Whist the City of Onkaparinga has recently seen a dramatic increase in the creation of permanent public art works, SUE recognises how the temporality of unexpected performance based interventions can add another creative dimension to public art strategies that explore and celebrate the diversity of culture, community, geography, history and land in the area. SUE will take place across the 5 wards of the City of Onkaparinga and include the creation of 10 new works by established local and national Australian artists. The diversity of sites will offer the artists and curator alike a fertile space for experimentation and innovation within form, practice and content. PARTICIPATING SUE ARTISTS: Carlie Angel, Valerie Berry, David Cross, Alison Currie, Nadia Cusimano, James Dodd, Ruby Dolman, Sara Morawetz, Tobiah Booth-Remmers, Henry Jock Walker and Meg Wilson. The Human Arts Movement is an Adelaide-based contemporary dance training and performance collective. I have been working with them throughout the month of September with the following dancers as seen in the image below: Cazna Brass, Rita Bush, Cayleigh Davies, Petra Szabo, Georgia Timperon, Peter Vayne, Kendal Winton, Greta Wyatt. Through collaborative task based making, improvisation and taught choreography we have created a short work which will be shown at a work in progress showing on Monday 25th September at Restless Dance Theatre. It is rare to work with eight dancers as an independent choreographer in Australia and so all of the ideas I had wanted to explore with a larger group have come up in this process. We began working with patterns and rhythms and with my interest in gradation and the gradual change from one movement to the next. The working title 'Creatures' came in part from attempting to fit in the smallest floor space with the dancers and various creature like images which emerged from that point; cell division, evolution, flocks and packs etc. An approach to the composition of particular moments in 'Creatures' was taken from a work 'THE MAIN EVENT' that Solon Ulbrich and I co-directed at Adelaide College of the Arts in 2009. Last weekend Alisdair Macindoe, Lewis Rankin and I had an amazing four day development as part of Adhocracy 2017 at Vitalstatistix. The focused atmosphere of Adhocracy (where several groups of artists from across the country come together to work, share and discuss ideas) provided a perfect space for us to experiment with the early stages of this new Idea. Alisdair Macindoe and I have collaborated across several projects over the last 10 years, yet this was our first time Co-directing a work. 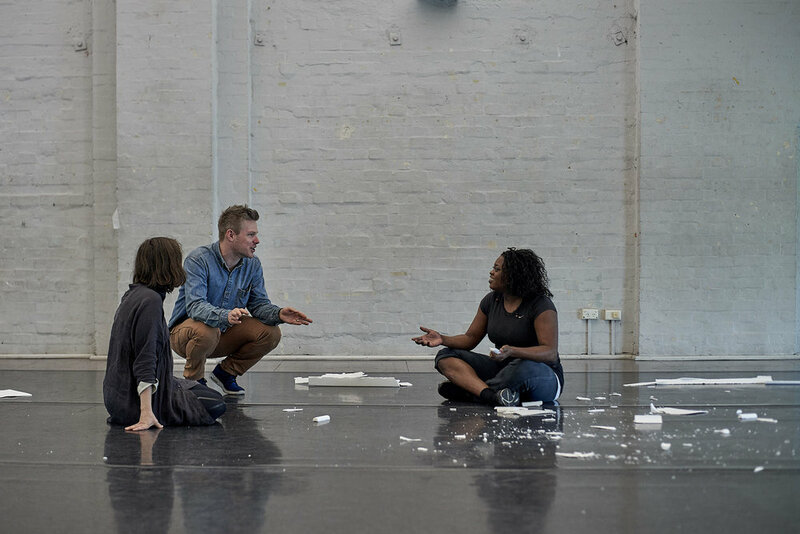 The working title is Solo for (Hu)man and Foam and we are certain that we would like to keep developing this work with Lewis Rankin, though we are less certain about the title. FRAN Festival is happening in Adelaide at the moment. FRAN stands for the Feminism Renewal Art Network and as well as being an exciting female focused festival, marks a significant anniversary - "Forty years ago Adelaide was host to one of the largest Australia-wide exhibitions of women’s art, The Women’s Show of 1977. The Women’s Show exhibited over 400 works, and included the work of established and emerging artists as well as those who had been overlooked, lacking institutional and commercial support." Read more about the festival here. The South Australian Living Artists (SALA) Festival is held each year in August. I realised this year that I have performed in SALA Festivals fairly consistently since 2005. Other than realising my age I felt quite proud (?) or amazed or something to realise I have been treading the boards as a dancer and choreographer at this festival for the last 12 years! Recently Leo Greenfield wrote about and painted a portrait of my sister and long term collaborator Bridget Currie and me in he Adelaide Review. You can read the article here . It was lovely to meet Leo for lunch and to talk art and life. You can see more of Leo's work here. I am a choreographer, performer and dance artist living and working in Adelaide, South Australia. In an attempt to write more about my work and ideas surrounding I have started this blog page. More information about completed projects can be found on the individual project pages.